How are Seniors Served by the Mayor's Housing Plan? Communities are paying close attention these days to exactly what kind of affordable housing is being promised to their neighborhood because they want to ensure that the housing is really meeting the greatest local and city need. Communities are paying close attention these days to exactly what kind of affordable housing is being promised to their neighborhood because they want to ensure that the housing is really meeting the greatest local and city need. Over the last several weeks, ANHD has published analyses of the affordability levels of units created under Mayor Bill de Blasio's Housing New York plan and how they compare to the need of New York City residents. Our newest analysis looks at Housing New York's production of senior housing to see how affordability stacks up. We compare income levels of the senior population to those of New York City as a whole, and to the affordability of the units created by Housing New York so far. Here, we find that the de Blasio plan is doing an excellent job of building to the New York City senior population and income need. 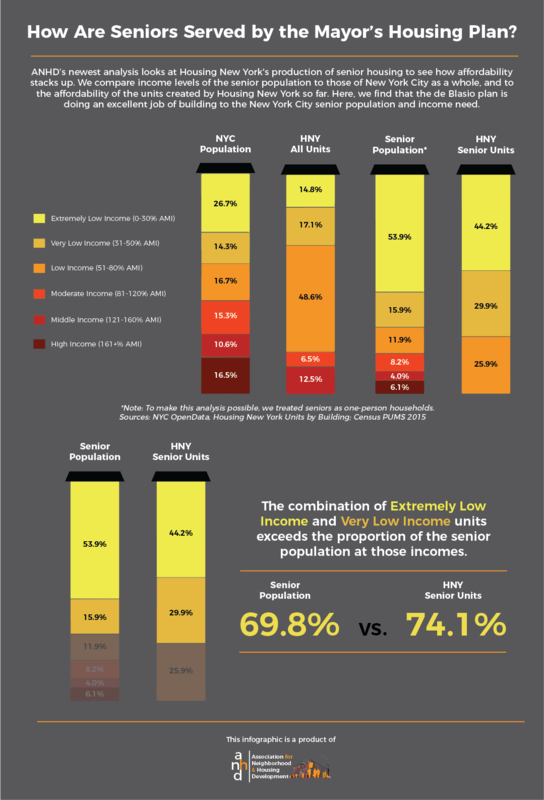 While we find it important to understand need by comparing rent burden at different income levels to the affordability of new units, rent burden data specifically for New York City’s senior population is limited. Available data shows that New York City’s seniors are much lower-income than residents overall. 54% of seniors fall below the 30% AMI level*, versus 27% of all New Yorkers. We found that the combination of Extremely Low Income and Very Low Income units exceeds the proportion of the senior population at those incomes. Overall, the affordability levels of senior units are a better match for the specific population versus Housing New York units overall, especially at the lowest income levels. At the same time, the total 4,627 senior units make up just 6% of all Housing New York units created so far. As New York City’s population ages, the City must create housing that meets the need. A March 2017 report by the NYC Comptroller found that “the number of New Yorkers over 65 grew by 19.2 percent, which was more than double the rate of the total population (7.47 percent), and more than triple the rate of the population under 65.” Living on a fixed income makes truly affordable housing critically important.